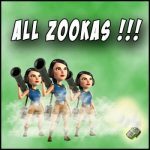 All zooka attack guide | Boom Beach. All about the Game! 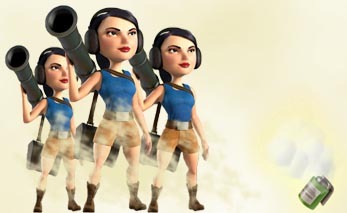 If Your skills in AZ (all zooka) attacks are perfect – You’re desired player in almost every big TF (Task Force). In my experience on high level operations the number of AZ attacks can reach up to 50-60% because other combinations such as “TMeds” or “Scan” are less effective there. As a rule “all zooka” tactic requires a player to great attention, prudence and mastery. Judge for yourself: delay with smoke screen – failed, chose wrong position for attack – failed, not take into account all obstacles on the rout – failed… In this post I’ve tried to write all necessary information I know which can be useful in learning of AZ attack strategy. 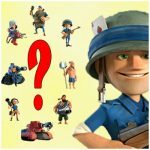 I think every player knows that Zooka has the biggest lvl of damage power in Boom Beach. Only one max lvl Zooka can cause a 1.076 of damage per shot. Accordingly 104 of them (maximum quantity which is available in the Game) can cause 111.904 of damage per one volley and this is without “red” statues… Consequently there is enough only two volleys or four seconds for the destruction of HQ 22 lvl. But there is another side… Zookas have the poorest health and dying almost from any sneeze. That’s mean we need to plan our AZ attacks to the smallest details. First of all we need to inspect the location of defensive weapons near the HQ and try to find the safest place for our units from where they will be able to attack it (we will lead our troops into this place after landing). The other important point is to check the total amount of HQ health with effect from “ice” statues. This allow to calculate the rough number of volleys required for HQ destruction and determine whether they will have so much time or no. This is important. 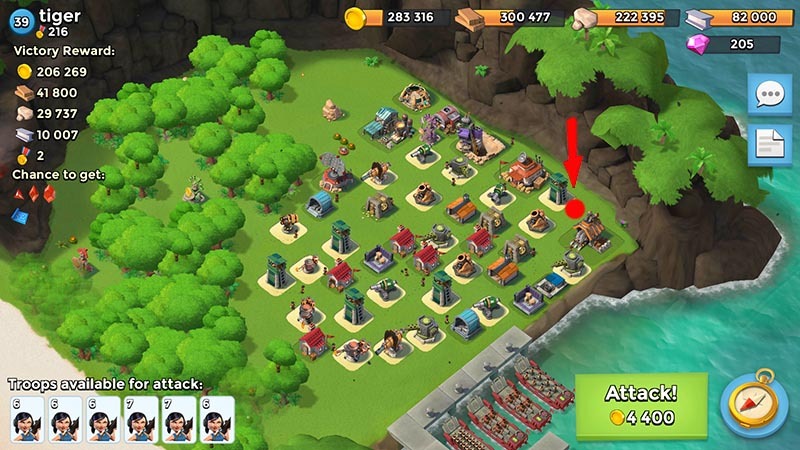 If you managed to find the gap in the enemy’s defense and have seen the place from where your Zookas can destroy the HQ – don’t rush to start an attack because we need to choose the most suitable place for landing before. Landing zone and chosen for attack place have to be approximately on the one line. This allow to keep Zookas in compact group on their way and minimize the loses. Try to avoid unnecessary turns during the move. The main task during the landing is grouping of all Zookas into a tight group. That allow to cover them properly by the smoke during the moving. Note: the tight group – it’s when it’s possible to cover it in one smoke. In this case we need to put flare at any side of the shore line and then begin to land crafts slowly one by one. After landing all Zookas will move to the flare and gather into a tight group. But it’s important to remember that after reaching of the flare Zookas won’t stop and begin to move in the direction of nearest enemy building (if there won’t be of any building in their range of fire). In this method we can use the nearest enemy building as a place for grouping of our troops. This method is very good when there is any enemy building near the shore line. All we need is to put landing flag near such building and cover this place by the smoke. In such case Zookas will stand and wait until the smoke clears because the building will be in their range of fire. But we need to be careful with this method because if the building stands alone Zookas, preparing for attack, can surround it with a semi-circle formation and leave the safe place under the smoke screen. Now let’s turn to the moving. The main task for this part of attack is the saving of the largest possible amount of units. The best way to do it is to move in straight line. The more your route will deviate from a straight line the more Zookas will spread and consequently the more units will be destroyed. Another important point – don’t throw the flare on a building when showing the direction of moving for your troops. Throw it only on the open ground. Don’t panic and don’t react if some of Zookas fell out from the group and stepped out of the smoke screen. As a rule – they are doomed. It’s useless to throw an extra smoke to cover them because till the smoke gets there all of them would be killed. Just keep moving to the aimed place. Note: of course if a splinter group is too big an attempt to continue the attack may become useless. You have to appreciate your chances by yourself. Another important moments: Don’t forget to cover troops by smoke on their way in right time (better to throw another smoke earlier then later). Try to avoid overlapping because it saves energy. And all time keep your eye on the flare timer. You should always split attention between the moving troops and flare timer. Believe me, it’s not so easy and first attempts may be unsuccessful. It’s normal. Here below is an excellent example of landing, grouping and moving from member of our TF “Chicklets” – Ka Lucho. 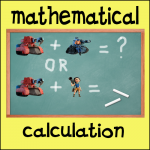 This variant may be chosen if you are sure that for the time it takes to destroy HQ (you should to calculate it at the planning stage) your Zookas will be able to produce the required number of volleys. Or in other words your remaining energy should be sufficient for neutralizing all the most dangerous for Zookas defensive buildings on this time interval. In that case until the expiry of smoke screen action throw a flare at the Headquarter thereby indicating them the target for attack. Clearing all dangerous defensive buildings with the next attack of the HQ. There is a very good thing as a behavioral factor which was programmed by developers. According to this ability, from all buildings which are in their range, Zookas will attack defensive ones first of all, and only after destroying all of them they switch attention on civil buildings. Respectively we may not target them on the HQ immediately… we can take a few seconds pause and our “ladies” will clear all defense near them. 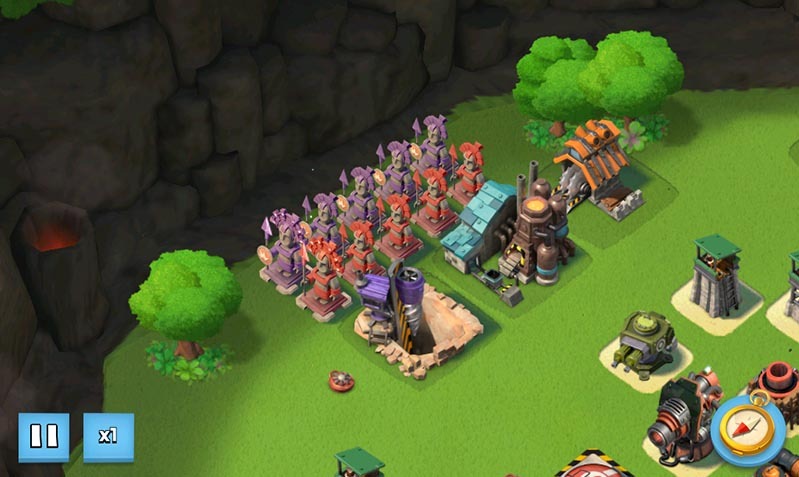 But this works only in case when there are no many defensive buildings near the HQ. In the example below you can see the successful attacks on the bases, the images of which were in the first part of this article. 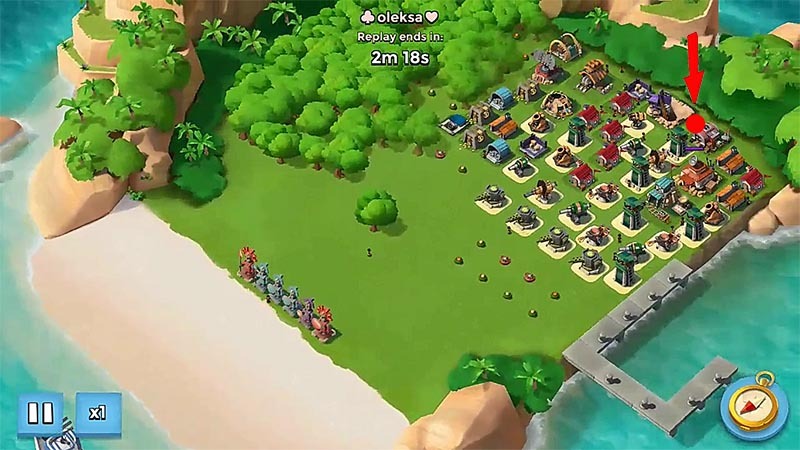 If you’re a type of player which Boom Beach community calls “farmer” this tactic isn’t for you. Note: Farmer in Boom Beach is a type of player who sets mostly “green” and “ice” statues on own island and collects resources for upgrades mostly from own production. This tactic requires a lot of Gunboat energy. On my 65 lvl acc I have only two GBE statues and successful attacks I can make only when statues are boosted. My second account is oriented only on attacks and I have only “red” and “purple” statues there ..but now is not about that. So the basic set of statues of all-zooka-attack player must include GBE and TD increasing statues. Note: TH increasing statues aren’t necessary because they almost won’t give any positive effect due to very low Zooka health. Of course it’s possible to make a successful attacks with a fewer amount of “red” and “purple” statues but here need to understand that the farther is the HQ (core) from the shore the more energy we need for attack. All guides and instructions are good but they are useless without practice. Only practice, practice and practice helps hone skills. It’s an axiom. So don’t be afraid to practice. As for me I think that the best place for it is a some large TF. But don’t try to practice during the operation… Just ask someone from partners to make a friendly challenge… this is the best way to get the skills because it’s not needed to wait for loss replenishment after each attack and you always can ask for an advise. P.S. There are a lot players on Youtube who share their videos. Very good in this tactic are players IMPERA CATALISS and General Masher. You can view their videos and get something useful for yourself. 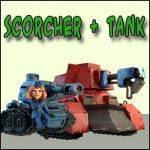 «Scorcher and Zooka» or «Scorcher and Tank»: mathematical calculation. What is your favorite combination? Poll. Scorchers and Tanks. Basic factors. 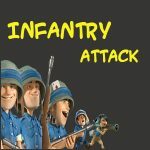 This entry was posted in ATTACK, UNITS and tagged Attack, Units. Bookmark the permalink. Interesting, i should practice zookas as recommended and what will help me is to add one more GBE statue as soon as my landing craft upgrades are over; having a fourth GBE will make all the difference ! it’s tougher than what we make it look like, but you’ll eventually be more skilled at it sometime! Looks like you first take out rockets and mines along route with gbe then use robots to distract defenses around HQ?